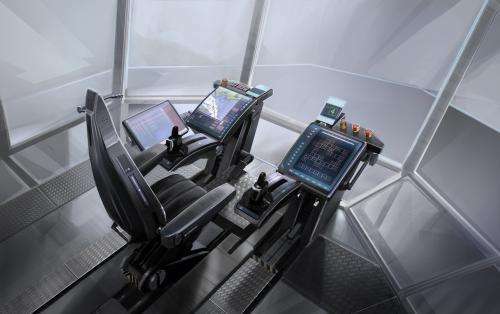 Cargo ship bridge of the future. 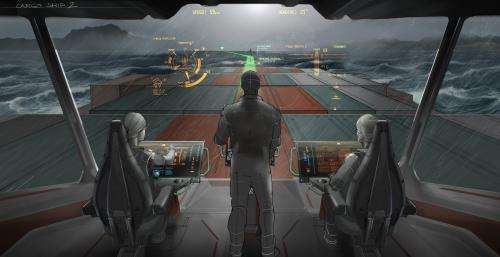 In the design of future innovations for seafaring, VTT's researchers in cooperation with Rolls-Royce combined research of crew operations, future studies, and user experience design. Crewmembers, including ship captains and first mates, were on board this project to evaluate ideas contributing to safety, energy savings, and functionality. Smart workstations adjust themselves based on who sits down at them. The bridge window serves as a heads-up display, showing not only navigation information, but also the routes of one's own ship and other ships. Augmented reality technology enables crewmembers to keep an eye on obstacles that would otherwise be obscured by distance or weather. A sea ice analyser indicates whether the planned route in ice conditions is safe and economically feasible. In the future, it will still be important for the watchman to keep his or her eyes on the sea: for instance, when it is dark outside, the window displays thermal camera images directly over the external world, enabling the watchman to remain focused on the sea. Tug ship bridge of the future. The ship bridge project was carried out as part of innovation company FIMECC Oy's FIMECC UXUS programme (User experience and usability in complex systems) in 2012–2013. "The project has successfully combined experience-driven design, in-depth psychological and operational analysis of tasks, and the envisioning of future technological solutions, and has packaged them in the form of impressive, futuristic videos that will inspire actors in this field to adopt user experience based solutions," says Programme Manager Maaria Nuutinen.